One reason that I decided to share these LabTV profiles is that they put a human face on the amazingly wide range of NIH-supported research being undertaken every day in labs across the country. So far, we’ve met young scientists pursuing basic, translational, and clinical research related to the immune system, cancer, Alzheimer’s disease, and the brain’s natural aging process. Today, we head to Boston to visit a researcher who has set her sights on a major infectious disease challenge: tuberculosis, or TB. Bree Aldridge, PhD, an assistant professor at Tufts University School of Medicine in Boston, runs a lab that’s combining microbiology and bioengineering in an effort to streamline treatment for TB, which leads to more than 2 million deaths worldwide every year . Right now, people infected with Mycobacterium tuberculosis—the microbe that causes TB—must take a combination of drugs for anywhere from six to nine months. When I was exposed to TB as a medical resident, I had to take a drug for a whole year. These lengthy regimens raise the risk that people will stop taking the drugs prematurely or that an opportunistic strain of M. tuberculosis will grow resistant to the therapy. 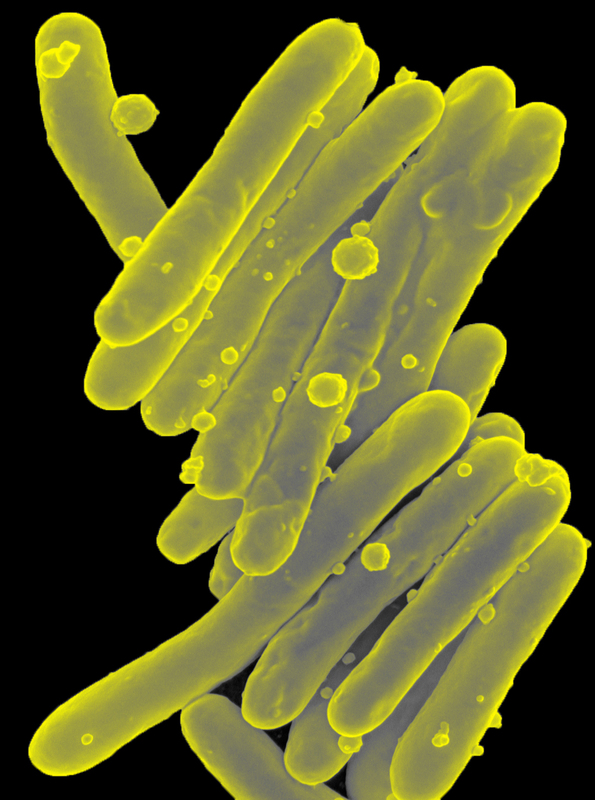 By gaining a better basic understanding of both M. tuberculosis and the cells it infects, Aldridge and her colleagues hope to design therapies that will fight TB with greater speed and efficiency. Colorized scanning electron micrograph of Mycobacterium tuberculosis. Source: Clifton E. Barry III, Ph.D., NIAID, NIH. Tuberculosis is an ancient scourge that has evolved in lockstep with humans for more than ten millennia. It infected residents of ancient Egypt; remnants of Mycobacterium tuberculosis, the deadly bacterium that ravages the lungs and other organs of its victims, have been found in Egyptian mummies dating back 3,000 years. It is considered one of the world’s deadliest diseases. I’ve had my own experience with TB. As a medical resident in the intensive care unit in North Carolina in 1977, I was exposed to the bacterium during emergency care of a young migrant worker who arrived at our hospital in extremis from internal bleeding. Only after the hemorrhaging was stopped did we discover his advanced tuberculosis. But I’m happy to say we treated him successfully with a battery of drugs, and he walked out of the hospital. My own TB skin test tested positive a few months later, and so I had to take a year’s worth of therapy with isoniazid to wipe out those little microbial invaders. That was all it took. For the most part, TB cases have been reduced to a trickle in the Western world—thanks to antibiotics—and relegated to the history books with descriptions of ‘consumption’ in nineteen-century England and tales of jail-like sanatoria where those consumptives were quarantined and often died.